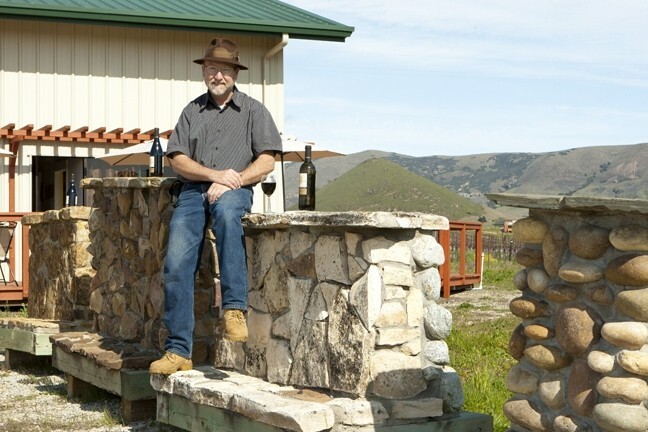 CHILLIN’ IN EDNA: Steve Autry pairs fine wine with wildlife at his tasting room in Edna Valley. You can’t help being amused by the jack rabbits and raptors feeding off the land. Autry so loves the wild bunnies, struggling to survive under his deck surrounding the tasting room, that he feeds them so they can stay in close range of the shelter. It keeps them safe from the predatory peregrine falcons that live nearby. Inside the tasting room, you can’t help but appreciate the view of the wildlife and the shiny metal objects that frequently streak past, while tasting Autry’s array of intriguing wines. Or you just might want to bring along lunch, buy a glass or a bottle of your favorite variety, and sit on the deck to take in all of the beauty Mother Nature and mankind provide daily. The loquacious Autry loves being in the heart of Edna Valley so much, he admitted he’d like to live there. He might as well relocate from Los Osos, since he opens his tasting room daily from 11 a.m. to 5 p.m. And you’ll usually find him attending to the stream of tasters while still managing to tend to his craft on the winemaking side of the building. During a recent visit, I interviewed Autry in between breaks while he served locals, most of whom said they came after hearing high recommendations from friends about his fine wines. Autry began our interview with a visit to the production side, where he discussed the equipment and his methods for making small lots of wine. There was no doubt about his devotion to detail in his handcrafted wines—not surprising, considering the fact he managed Doc’s Cellar in the industrial section of SLO, a supplier of winemaking equipment for home winemakers and professionals. He started out part-time and soon earned a full-time position. WORLD OF PINOT NOIR TICKETS ARE AVAILABLE: Here’s some good news for all the procrastinators who fear they’ve already missed out on the wildly popular World of Pinot Noir Celebration, set for March 2 and 3: You can still get into some great events. On Friday, tickets are still available for the morning and afternoon seminars that include lunch by Thomas Hill Organics; reservations are $195 per person. Saturday evening reservations are still available for two of the popular World of Pinot Noir dinners at $150 per person. I chose et Voila, where the multi-course dinner will be paired with Pinots from Lincourt, Presqu'ile, Sinor-LaVallee, and Sokol Blosser. Another popular restaurant, the Neon Carrot, will pair courses with Pinots from Anne Amie, Sequana Vineyards, Stephen Ross Cellars, and Zotovich Cellars. For more information, call WOPN at 489-1758, or buy your tickets online at wopn.com. After three years spent helping other winemakers, he left to open his first winery in the same industrial area on Capitolio Way off Broad Street. He moved after a neighbor told him about a professional space available in Edna Valley off Highway 227 that was on Craigslist. Autry visited and found it the perfect spot to establish his winery and tasting room. He remembered: “The first place didn’t have the ambiance, and the owner of this property told me he had always wanted a winery here.” Given his love of nature and vineyards, it must have seemed a piece of heaven on earth. Autry doesn’t own vineyards, but he’s selective about choosing vineyards from which he buys grapes in Paso Robles and Edna Valley. When we began tasting the wines, Autry said something I had only rarely heard before: “I make white wines for the red wine drinkers. I take the white wine rules and break them.” For instance, rather than buy Sauvignon Blanc from cool-climate vineyards, New Zealand style, he prefers the warmer Creston region in Paso Robles. What was truly unusual was hearing that he lets the Sauvignon Blanc hang longer on the vines so the grapes are fully ripe and mature. When I tasted the wine, it was nothing like I expected: The intense fruit flavors were ripe, but not overly so, and it was nicely balanced with tangy acidity. The reds were just as unique, but I favored the Tempranillo and Malbec, which were outstanding. One could write a book about Autry, who’s also a professional bass player and performs with three bands. There’s not enough room for all of it in this column, so I can only say this: if you want to know more about his story and you’re looking for a wine tasting experience that’s outside the ordinary, a visit to Autry Cellars will provide a memorable experience.